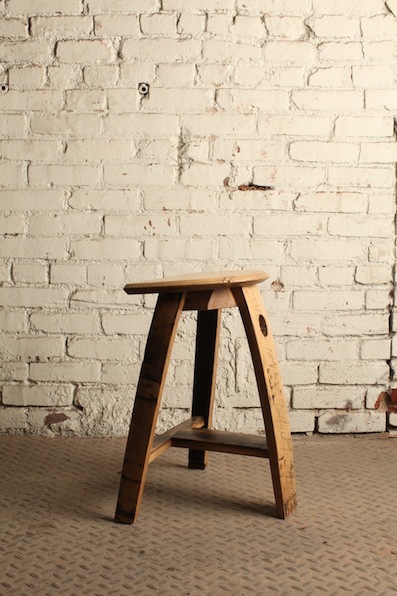 Made entirely from the wood of reclaimed oak bourbon barrels, each stool is uniquely handcrafted and made to order. The simplicity of the design was inspired by an antique country milking stool, while the use of bourbon barrel parts creates a union of patina and strength with a refined rusticity that will not go out of style. The slight angle of the seat is ideal for putting on your boots, or setting down electronics for a quick work table. No two stools are alike, and it is their imperfections that makes each one stand out. Measures 20.5 to 22 inches tall. Can be purchased as part of a set with table, individually or in a 'Bourbon Barrel Bar Stool' version.